Slice the marinated tenderloin paper thin (for best results, freeze for 1 hour prior to slicing). 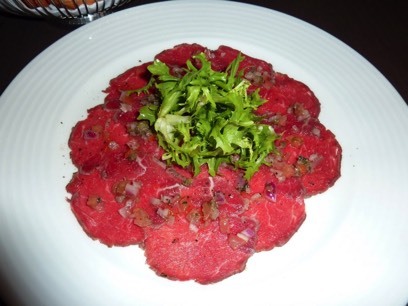 Divide sliced beef between two plates. 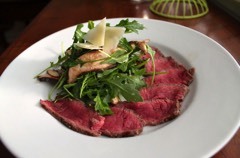 Garnish each plate with 1 cup arugula. Top each dish with 1/2 tbsp. of reggiano cheese. Sprinkle with capers. 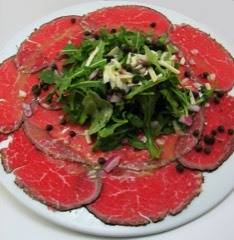 Drizzle each carpaccio with 1 tbsp. of lemon & olive oil dressing. Trim 1lb/450g of beef topside and put it in the freezer. When it is part frozen and firm, take it out and cut thin slices, about the width of a strand of spaghetti or a little thicker. •	Cut two large sheets of silicon baking paper. Place about 4 slices on one sheet, well distanced from one another. Place the second sheet on top and bash with a meat hammer or rolling pin until the slices have expanded and thinned. Peel them off the paper and lay on a plate. Repeat with all the beef and keep in the fridge, covered with clingfilm for up to 12 hours. •	Make a dressing with 2 dessert spoons of Dijon mustard, 5 tbsp of extra virgin olive oil, salt, pepper and the juice of half a lemon. Scatter rocket, mustard leaves, dandelion or watercress leaves over the top and zigzag the sauce over them. 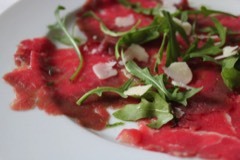 This one isn't classic Carpaccio as the beef is seared on the outside but looks great. I really liked the sound of this one with roasted pine nuts & truffle oil.